Gorgeous, right? The set comes with this beautiful floral display of tulips and anemones. You get two. One with the butterfly and one without. Who doesn't love a butterfly, though? And, you also get a wonderful sentiment. Here is what I did with this set...please click on the photo to enlarge it. I printed it onto smooth white card stock and colored it with colored pencils. I used Polychromos and Prismacolors. I like combining the two, they play nicely together. I printed an extra image so I could color and fussy cut the butterfly. I just used the wings. I wanted to add a little extra something to the card, so I popped the wings up with dimensional adhesive.I also gave the wings some sparkle with a Clear Wink of Stella glitter brush. 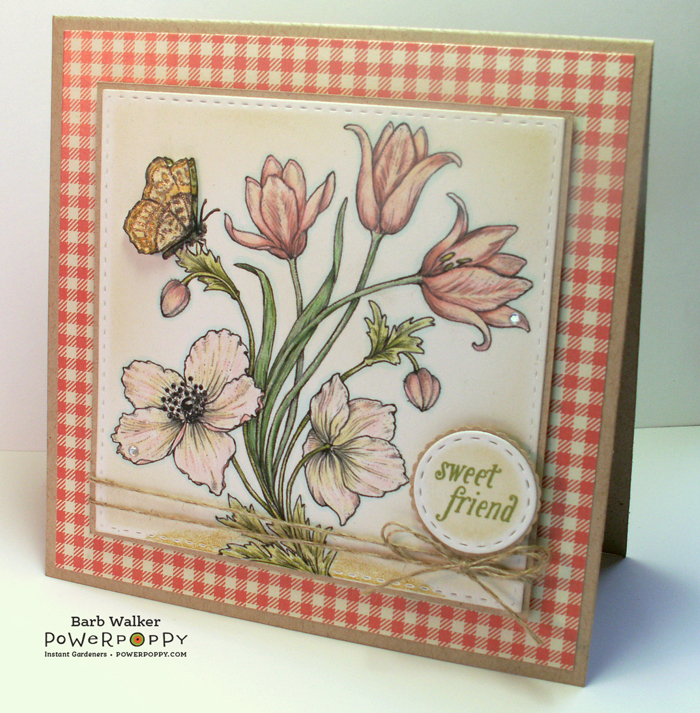 The "sweet friend"greeting is from a Power Poppy clear stamp set called, Go Wild. After I die cut the image, I gave it a light dusting around the edges with Antique Linen Distress ink, I then matted it with Neenah Desert Storm card stock and adhered it with foam tape onto my card base. 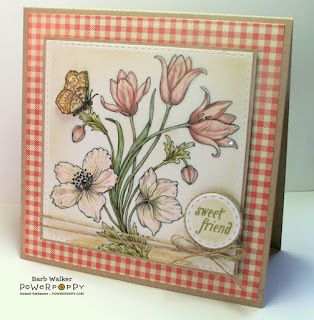 I am love with gingham and this background paper I used is from the Petals and Wings collection from Gina K Designs. I just love the color and it pairs so well with the Kraft tone of the Desert Storm. 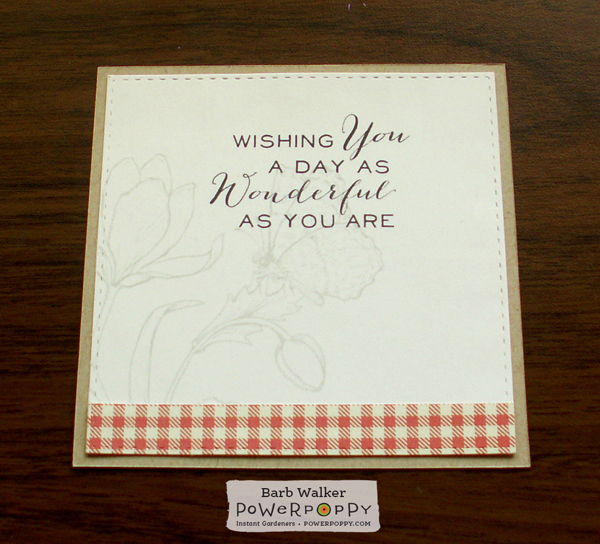 I used a sentiment from Gladioli, another digital set from Power Poppy. I cropped out the butterfly and changed the color to a pale gray so I can still write a message over top. And that's all I have for you today. 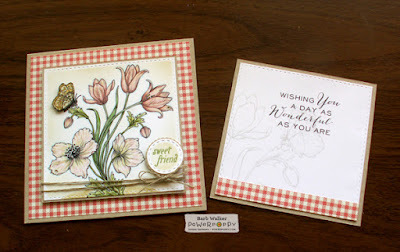 Please take a moment to buzz over to the Power Poppy blog to see what my team mates have created with this sweet set. Thanks for stopping by! I appreciate the visit. Barb, Thiks is just lovely!!! The gingham and twine are such a country charm pairing! what a stunning card & loving the softness of the colours you chose which co-ordinates beautifully with your DSP. Very inspirational. oh boy! you sure bring her imges to lovely life! I just love this feminine color pallet and you know I'm a fan of gingham and linen thread! I need this card, I'll pay you Five Bucks, Six Bucks? I'll pay you Seven Bucks! I've got Pay Pal! Lol just kidding. It's that incredible Barb! Pinning! Your card is absolutely delightful and charming, Barb. I adore how you colored it in and added the dimension on the butterly. Also like the dew drop bling you add on the flower, too. ;) I adore the gingham and the twine. I also really like your addition of the image on the inside, only lighter. Adds a wonderful touch. Your style of cardmaking is fabulous. There is a timelessness to what you create that I just adore. Thank you for sharing! Hugs!